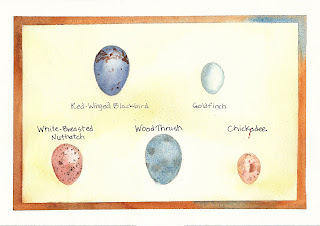 I jost love the soft colors of birds' eggs. I even always buy brown eggs at the market and admire the subtle differences in their shell colors. This is a small painting (7"x10") that's inspired by the photos in a book, "Birds of America," published in 1936. The book belonged to David's Aunt Julia, and was passed on to us by his mother, Bernette.